I hope you are the kind of person who thinks Roasted Carrot Grilled Cheese is an awesome idea—especially after I tell you that it has pickles. We will be friends. If the idea of Roasted Carrot Grilled Cheese (with pickles) seems more “odd” to you than “awesome,” I am not abandoning our budding friendship. We can always bond over something else, perhaps Raspberry Jam Corn Muffins or Chocolate Chip Peanut Butter Cake. Cornbread and chocolate are excellent catalysts for friendship. Since we are going to be friends, I should warn you that I’m strange. I wish I had a dollar for every time I caught myself doing something weird, such as standing over the sink dipping pickles in peanut butter or singing show tunes aloud while Ben and I walk to dinner. Sometimes my wacky behavior ends poorly—Ben moving to the other edge of the sidewalk, then giving the people we pass a mutual look of understanding that reads, “Can you believe this random girl with whom neither of us is affiliated is singing right now? Awkward.” In golden moments, however, my unusual antics end in pure brilliance. Roasted Carrot Grilled Cheese is my wacky-idea-proves-genius manifesto. This toasty dish is a marriage of flavors so fantastic, I ate it three nights in a row. Roasted Carrot Grilled Cheese fuses each aspect of the flavor spectrum into one outrageously tasty sandwich. 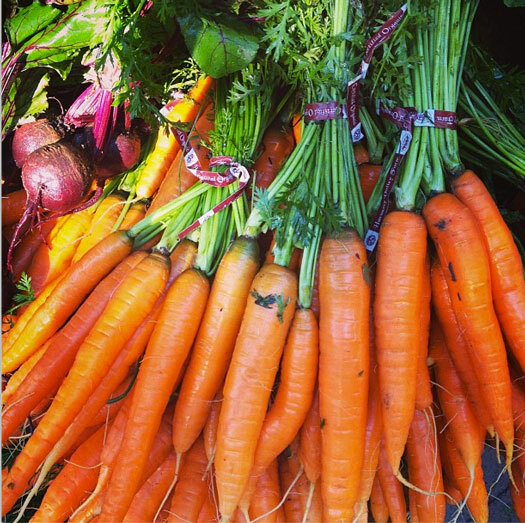 Meet our flavor-craze line up: Roasted carrots bring the sweet and mellow. A quick, homemade spread of Greek yogurt, savory Dijon mustard, and a subtle hit of cayenne brings balance to the sweet. 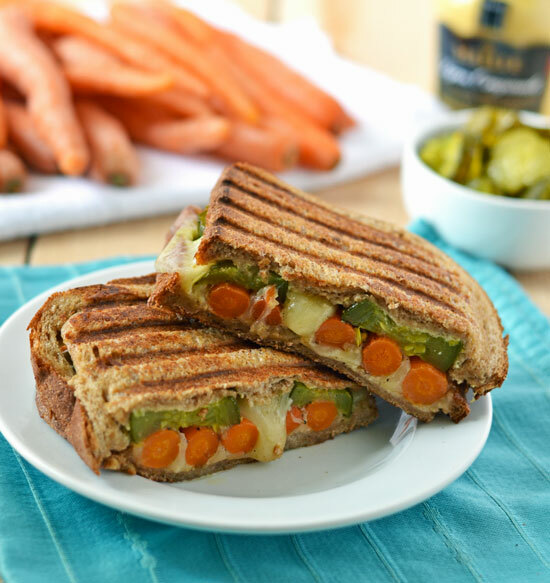 Havarti cheese provides creaminess and depth, and our wacky enlightened addition of pickles is the final bite that catapults Roasted Carrot Grilled Cheese to Flavor Harmony Nirvana. Yes, Flavor Harmony Nirvana. It is a place, and Roasted Carrot Grilled Cheese is its king. When making Roasted Carrot Grilled Cheese, be sure to use slender, fresh carrots, which have a sweeter flavor and roast more quickly than their thicker counterparts. I purchased my beauties at the farmers market, but you can find them at most grocery stores, usually with the greens still attached. I chose Havarti cheese for is buttery flavor and exceptional goo-factor when melted, but I’d imagine that any mildly flavored, smoothly melting cheese would be fabulous as well. Let’s toast our blooming friendship with two warm, savory Roasted Carrot Grilled Cheese sandwiches. We may be pals, but no going halfsies here—Roasted Carrot Grilled Cheese is far too satisfying to share. One bite, and you will want it all, especially the pickles. Warm, toasty Roasted Carrot Grilled Cheese is a satisfying meal that astounds with its satisfying, perfectly balanced flavor. 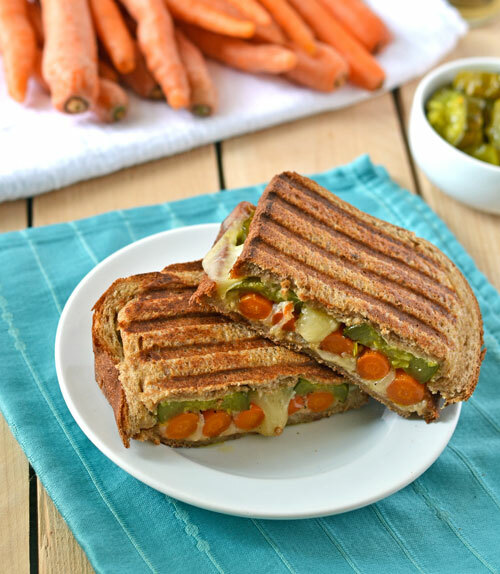 With gooey Havarti cheese, sweet bread and butter pickles, and a tangy Dijon Greek yogurt spread, Roasted Carrot Grilled Cheese is easy to prepare and outstanding to eat. Place rack in upper third of oven and preheat to 450 degrees F. Spread carrots on a baking sheet, drizzle with olive oil, salt, and pepper, then toss to evenly coat. Roast carrots for 15-20 minutes, until fork tender and lightly blistered. Remove from oven and set aside. Meanwhile, combine Greek yogurt, Dijon mustard, and cayenne in a small bowl. Preheat a Panini press or large skillet to medium high. Top 2 of the bread slices with 2 slices of Havarti each. Place carrots in a row on top of each, so that the carrots cover the slices completely. 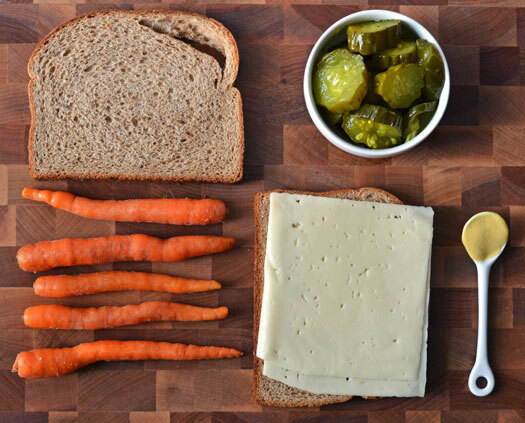 Top carrots with pickles, then flip the final slices of bread over the sandwich tops, butter side up. Place the sandwiches on the preheated Panini press or skillet and toast until the bread is golden and the cheese is hot and melted (about 3-5 minutes total for a Panini press or 3 minutes per side in a skillet.) Let cool for 2 minutes, slice, and serve immediately. 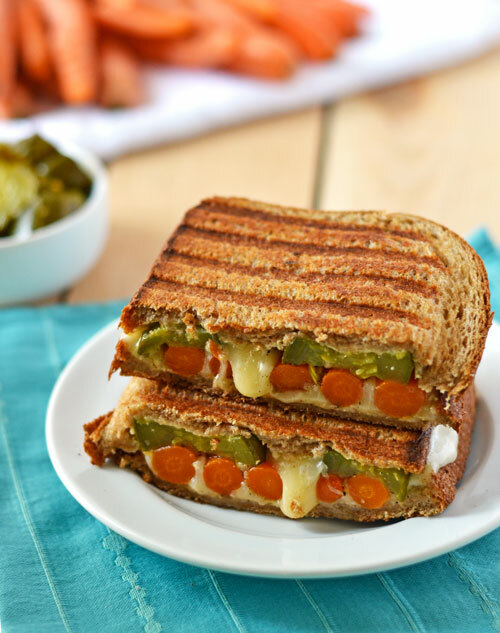 This combo sounds awesome – the sweet carrots with the sour-ish pickles and sheese = yum! Oh gawsh and you had to mention the peanut butter cake! I love peanut butter and I love cake…droolslurpmop! I am totes down with this!!! Whooo hooo! High five Liz. Bring on the crazy grilled cheese! Uh yes! This is crazy creative (and possibly weird:), but I really, really like it. No sandwich will look the same anymore. Pinned! Wow fantastic recipe, definitely want to try this. It sounds and looks delicious! Many thanks! Hope you love it. I’m intrigued by these flavors! Definitely have to give this grilled cheese a try! I think this would also rock with pickled carrots. But, sweet. This looks awesome! Thanks so much Consuelo! Fun to hear from a fellow pickle + grilled cheese lover. And really, I suspect that everyone has a weird combo they love deep down too! Roasted veggies are so delicious, I can totally see this sandwich being over the top amazing!! Thanks lady! And I totally agree: Roasting veggies (especially carrots) is the way to veggie bliss. Yum, I am with you this is genius! And I love the combo of pickles and peanut butter too- makes a great sandwich. So funny you say that–I eat them together all the time (right from their respective jars), but have yet to get them between 2 slices of bread. Time to change! I love the shapes that the roasted carrots make when the sandwich is sliced in half! Such a pretty bite. Thanks so much Kelly. And 3 cheese for the pickled grilled cheese movement. Ok, thanks so much for having such great inspired veggie food. I have 7, count ’em, 7 vegetarian kids, I NEED these kind of quick comfort food-y recipes for when we are cuddled inside after a cold and cruel day. Somehow I think a carrot grilled cheese and vanilla bubble bath, plus a big sleep, puts most things right again.